Convert RAW files to GIF in batch! You are here: CoolUtils > Total Image Converter > Convert RAW files to GIF in batch! RAW is a file format used by professional photographers because it yields the best possible results. However, images in RAW format can be viewed only with specialized programs that are not commonly used by computer users. That is why sometimes using a RAW photo converter to export RAW files into GIF is a good idea. 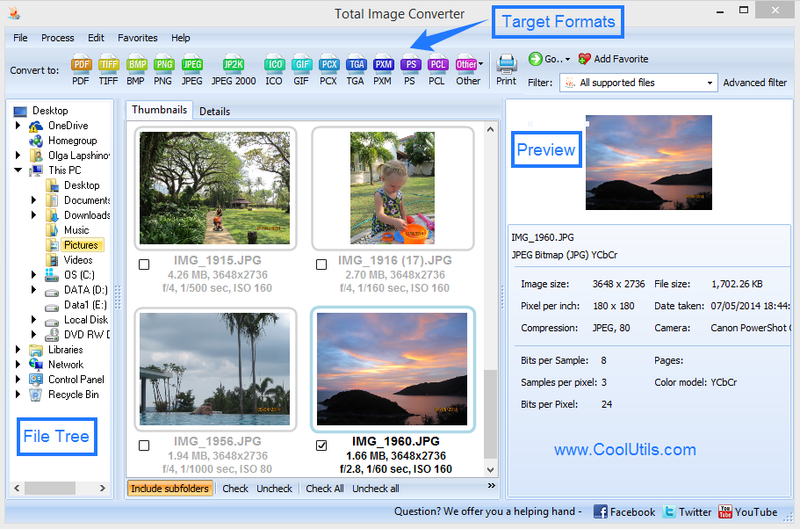 CoolUtils has designed Total Image Converter, a tool for those users who need a high-quality image converter at a competitive price. When you convert RAW, GIF is one of the best formats as it is widely supported by standard software. Total Image Converter supports GIF, as well as other formats when it comes to converting RAW files; among them are TIFF, JPEG, PNG, BMP, PSD, TGA, and more. 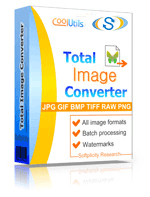 Furthermore, Total Image Converter is great for batch image conversion. With batch conversion mode, you can quickly convert RAW to GIF in batch. Guaranteed, this will take you only a few minutes! 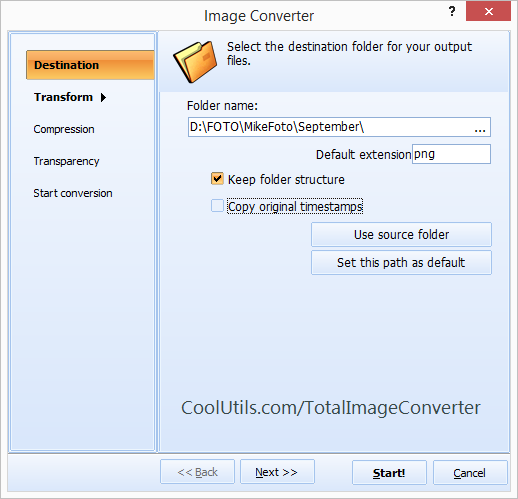 Download image converter by CoolUtils. It is available as a 30-day free trial version and as a fully functional version for just under $20. Install the converter following the instructions of the wizard. You can choose any of the supported languages (English, German, French, Russian, Spanish, Italian, Korean and many more). Open Total Image Converter or use command line (recommended for advanced users to quickly access the program). Select as many RAW image files as you need to convert from the list generated by the converter automatically. Set GIF as the target format and then adjust converter's settings. You can transform the output file by cropping, rotating or resizing it, adjusting color scheme and more. All the files you have chosen to convert in batch will be transformed. 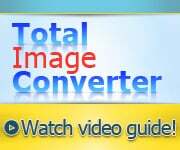 Download your version of Total Image Converter now and enjoy it! Your satisfaction is guaranteed!